In one interview, Frank Baldwin claimed that: "It was about this time that one of my 1875 models found its way to Europe, falling into the hands of a Mr. Odhner, a Swede. He took out patents in all European countries on a machine that did not vary in any important particular from mine, and several large manufacturing companies in Europe took it up. It is now appearing under ten to fifteen names in Europe, the more important being Brunsviga and Triumphator, manufactured in Germany." However, this assertion of Baldwin is quite questionable, despite of the fact, that Odhner didn't revealed his sources. Odhner seems to have been unaware of Baldwin’s calculator because it was patented in February, 1875, when Odhner was already working on his calculator project. Most probable, Odhner used as sources machines of Roth or Staffel, which were well known in Europe since 1840s. Actually the pin-wheel of Odhner resembled very much the pin-wheel of David Wertheimber (the english agent of Roth), patented in 1843. Especially the machine of Staffel was well known in Russia, because it was presented to the Russian Academy of Science in St. Petersburg and have been described in russian language. Later on Werner Lange has thoroughly analysed the differences of the designs of Odhner and Baldwin and noted that the system of Odhner, where the result register is moving and the input wheels are fixed, is mechanically better. Staffel’s calculator is in this respect similar to the Baldwin calculator, but the input wheels are much smaller. There are a few legends about how Odhner (see biography of Willgodt Odhner) became interested in calculating machines at a young age. There are two stories about that told by Odhner himself. First of them is, that as a quite young engineer Odhner had in 1871 an opportunity to repair a Thomas calculating machine and then became convinced that it is possible to solve the problem of mechanical calculation by a simpler and more appropriate way. 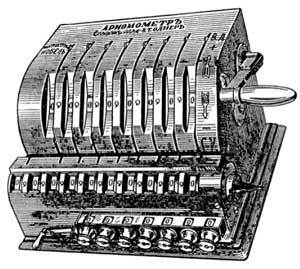 The other story is that in 1875 Odhner had read an article about Thomas arithmometer in Dinglers Polytechnisches Journal and thought it might be possible to construct a simpler calculating machine. No matter when Odhner commenced his arithmometer, the prototype was finished at the end of 1875. 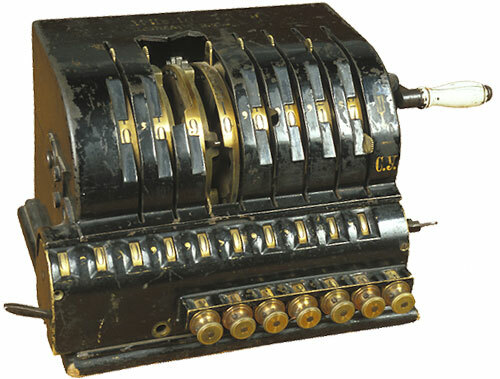 The device was a pin-wheel based calculator, housed in a rectangular wooden box and calculating with 8 digit precision. Odhner however didn't consider this device as his first calculator (may be it was too bad, or it relies too much on the ideas of Staffel or somebody else), because later on will write, that his first machine was manufactured in 1876, when was produced the second prototype (again pin-wheel, but with 8 digit precision). In the end of 1876 Odhner tried to convince his boss—Ludvig Nobel, to start the production of the calculator. Nobel made a deal with Odhner for producing 14 calculating machines. The capacity of these was 10 instead of 9 of the ”first” model. 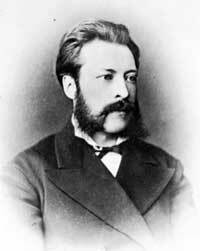 Nobel has given Willgott the use of a small portion of the factory to work with his machine and the production began at the beginning of 1877. Nobel and Willgodt have made an agreement that Nobel shall carry all costs to see the business started and until then he is paying Willgodt a salary on the condition that when the business has started they shall share for better or worse and take one-half of the profits each. These first Odhner's factory-made calculators finished at the later half of 1877 (see the drawing below), and total 14 machines were built. Later on however Nobel lost his interest and production was ceased. ...the same four basic arithmetic operations as with the Thomas arithmometer can be performed, even though the mechanism is different. Odhner arithmometer is much simpler with less different parts so that the price of Odhner’s device will be much lower, the price being one of the reasons of the scarcity of calculating machines. Odhner’s device, with the same capacity than the Thomas arithmometer, also demands much less space. The arithmometer is only the first prototype and it can certainly be improved, even though it is praiseworthy in its present form. One must also note that some of the defects of the device are caused by the fact that until now the machine has been made manually without any special machines for producing different parts. A final statement on all the details of Odhner’s device can be given only after a long-time use, but at least following remarks can be made. The durability of the revolution register clearing crank knob and the hook that moves the carriage is not sure. Sometimes the dial wheels of either the result register or the revolution register (counter) stop halfway between two values and it is impossible to know which of the two digits partially showing in the window is correct. The same defect appears also in Thomas arithmometer, but there you can jerk the device slightly to obtain a correct outcome in the window. This does not work in Odhner’s machine, but the dial wheel trigger mechanism could be be changed to correct this defect. The turning of the crank is rather hard. To start the motion it may be necessary to use so much power that one must hold the device with the other hand to prevent it moving on the table. The greatest power is needed when all the input values are set to nine. In the Thomas machine the effort is also greatest when all the input values are nine, but even then it requires much less effort than the device of Odhner. The size of the greatest possible multiplicand is 8 and the greatest possible multiplier 7, but the product can be calculated only with 10 numbers instead of the possible 15. This defect restricts remarkably the use of the device, but can no doubt be corrected. The tens carry operation is restricted so that only the 5 rightmost numbers of the product register are correct. By small modifications which do not increase the size of the device this defect could be corrected. Odhner certainly studied this statement very carefully and tried to correct the defects in the improved version of his arithmometer. In 1878 Odhner received the US patent №209416, (see the drawing below) but had to change his patent application, because some claims are found to be anticipated in the patent of Baldwin and in the patent of Alonzo Johnson (he was a holder of the patent №85229 from 1868 for a simple adding device). This is another evidence, that Odhner didn't know about Baldwin's machine, because in this case he wouldn't include the disputed claims in his initial application. The patent process was so fast and easy that Odhner and his business partner Königsberger decided to apply for a patent in other countries as well, thus they soon got a German patent (№7393 of 1878), a Swedish patent (№123 of 1879), and a Russian patent (№148 of 1879). The history of Odhner's machine can be followed further in the biography of Willgodt Odhner. The dimensions of the first machines of Odhner are:	29 x 11,7 x 14,8 cm, the weight is 6,3 kg. The mechanism consists of two disks: basic (called counting wheel), which has 9 grooves with fingers (marked with d) with projections. Over the basic disk is mounted a thin disk (called input disk) with groove L, in which are pushed in the projections of the fingers of the basic disk. The input disk can be rotated by means of a crank, and as the groove is in the form of two arcs with different radiuses, when the projection is pushed in the lower, then the finger is in lower position, and when the projection is pushed in in the arc with bigger radius, then the appropriate finger is in upper condition and is sticked out of the periphery of the basic disk. Thus, if we want for example to enter 5, we have to rotate the input disk so, 5 fingers from the counter disk to be sticked out. After all the digits are entered, then the main crank (the big crank in the right part of the machine), and all disks will be rotated according to the number of sticked out fingers of the appropriate counter disk, then the registration disk E, which is connected to a 10-teeth pinion will be engaged with the fingers and will be rotated to the proper angle. During this rotation the counter and the input disk are rotated together, so the entered number is kept. Newer models have levers for resetting of the input and registration mechanisms. The teeth I of the figure are part of the ten-carry mechanism. The cylindrical keys P, which can be seen in the front lower part of the body, are revolution-counters for the appropriate counter and input wheels. 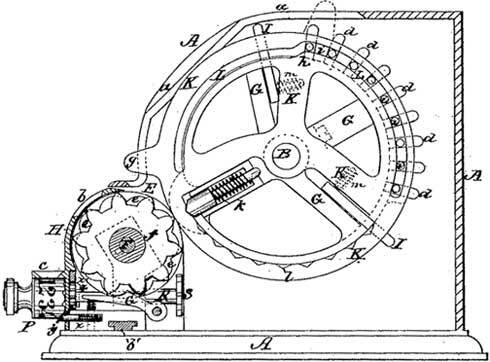 The mechanism with registration wheels is mounted as a separate block and can be moved leftwards and rightwards according to the mechanism with counter and input wheels by means of a slider. This is necessary during the multiplication and division. The adding operation is performed, as the addends are entered consecutively by means of the levers of the input wheels, as the entered number can be seen in the upper row of windows and by rotating of the main crank these numbers are transferred downwards to the registering wheels, and the result can be seen in the lower row of windows. The subtraction is done in similar way, but after the minuend was transferred to the registration wheels and the subtrahend is entered in the input wheels, the crank must be rotated in opposite for the adding direction. The multiplication is done by consecutive adding. First the bigger factor is entered by means of the input wheels, then the lever must be rotated so many times, according to the units of the other factor. Then the registration mechanism is moved rightwards by means of the slider, and the lever is rotated so many times, according to the tens of the other factor, and so on, until are used all digits of the other factor. The result can be seen in the lower windows. The division is done by consecutive subtraction. Let's examine the example, given in the patent of Odhner, 285582/8654=33. First we enter the dividend and transfer it by rotating of the crank to the middle row of windows (registration mechanism). Then setup the divisor, and adjust the slide H one place to the right, until the first digit (8) of the divisor id directly over the second digit (8) of the dividend, counting from the left. Then turn the crank C backward or to the right until the first digit (8) of the divisor can no longer be subtracted from the digits in the dividend which under and to the left of it. The number 3, which is the first digit of the quotient, will then appear on the second cylinder, P, and the dividend will be reduced to 25962, The slide H is next moved one place to the left, or back to its original position, and crank again rotated until the dividend disappears and a line of zeroes stands in its place. The figure 3 will then appear on the first cylinder, P, making the second figure of the quotient sought—to wit, 33. It will be seen, that the result indicates that the divisor, 8654 is contained three times in the first five figures, 28558, of the dividend, and three times in the new or second dividend, 25962.